In an email sent out to all T-Mobile employees this morning, John Legere outlined a corporate re-shuffle taking place at the Un-carrier. Undoubtedly, the biggest news is Mike Sievert’s move from CMO (chief marketing officer) to COO (chief operating officer). In the memo to staff – which we’ve been able to look at (thanks to our sources) – Legere states that he has created the position for Sievert. His responsibilities will include guiding all customer facing operations across the business, in a role which sees him responsible for marketing, sales and customer care for all distribution channels both direct and indirect, for each of the company’s brands. Taking Sievert’s place as Executive Vice President and Chief Marketing Officer is Andrew Sherrard. He will now lead the marketing teams for each of the brands under T-Mobile’s umbrella. Another new position is President – T-Mobile Indirect Channels. A role assigned to Tom Keys. He will now lead partner relationships including all dealers for T-Mobile and MetroPCS. Previously, Keys was EVP and COO of the MetroPCS business unit. Legere praises Keys’ work in his current role, expanding and growing MetroPCS’ distribution which helped make T-Mobile the largest prepaid carrier among the 4 national network operators. Other promotions include Ami Silverman, the new EVP of T-Mobile Retail, Jon Freier who has been promoted to EVP of Customer Care, Brian Brueckman the new SVP of Direct to Customer and Janice Kapner who is promoted to SVP of Corporate Communications. A huge congrats from us at TmoNews. After the past couple of years, it’s really no surprise to see key members of the team be rewarded for the momentum and growth achieved. Long may it continue. The only tinge of sad news is that the company’s COO of Business, Jim Alling – who joined T-Mo back in 2009 – has now decided to leave, having fulfilled his goals for T-Mobile and for himself. Alling will continue with the company for the next month or so before he leaves for “his next challenge”, and will aid the team’s transition. So two of the AT&T buddies are now running T-mobile? JL worked with ATT far far longer than he has with T-mobile..
And Tim Cook was at IBM before Apple, Eric Schmidt at Apple before Google… what’s your point? Hypocrisy. The two most vocal critics of AT&T learned their ropes from AT&T and now criticize aspects of ATT that AT&T perfected when they were there .. like contracts, subsidies, spectrum hoarding .. if you listened to JL now after he is born-again it’s like ATT and VZW ruined the industry with their practices, the same ones that paid their salaries for several years. Btw, Eric Schmidt never worked for decades at Apple, he was on the board as an independent director and left when Android came out. That’s like saying Al Gore worked at Apple and Reed Hastings worked at Facebook. Look up the definition of hypocrisy & you will find that it doesn’t apply here. If John Legere was saying one thing & doing the opposite in practice, then you could make that argument. He clearly no longer believes in the principles he once upheld. Your argument is invalid. “He clearly no longer believes in the principles he once upheld” – are you his soul keeper? 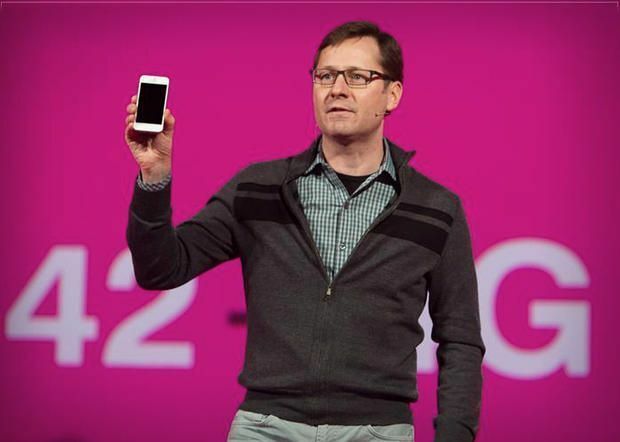 If he got the CEO job at ATT in a few years, you think he’ll be all saintly about T-mobile? He’s playing the best with the cards he has and changing colors, nothing about principles – its all about money. “Are you his soul’s keeper?” No. However, you’re not either. You might be right. I might be right. Who knows? In either event, no hypocrisy has been shown. By the definition of the word, you’re definitely wrong about that. Hypocrisy doesn’t have to be based on current relationships, it can be based on current behaviour vis a vis past associations. Dissing the same policies that paid your salary and acting as if I’m a newcomer outsider out to change the entrenched industry is hypocrisy, however you spin it or whatever be the reason. The word you should be prancing about is disingenuous. Not hypocrisy. However, are you seriously going to fault someone for being passionate about who they work for. Just because you learned skills somewhere certainly does not mean you are hypocritical to call them out. That seriously a ludicrous position. You could say he is disingenuous to have moved positions and suddenly had an epiphany to talk and preach in a different manner, but honestly that would also fall on deaf ears. CEOs switch companies all the time, it doesn’t make them a turncoat or a hypocrite necessarily. I am so enthused that Mr. Legere is passionate for T-Mobile and its growth. It is absolutely refreshing to see his tact in corporate USA. All the power to him and I thank him for trying to be different and making headwinds. While all the concepts and ideas may not be mainstreamed it has at least caused consumers to stop and think and make more decision based on more difference and options. The team and him at T-Mobile have absolutely rocked it over the past year or so. I am sorry that you are somehow bitter over a non-issue. Legere is T-Mobile and he bleeds Magenta as he should because he is the face of the company. He drives a big bus and people are boarding constantly. Hop off if you can’t see past something so ridiculous. Interesting you mention JL drives the T-mobile bus… lets see who he throws under the bus if things aren’t rosy anymore.. I’m not faulting him for being passionate about where he works, I’m saying his passion is profit driven, nothing altruistic about it. And I’m not bitter about it, I’m saying dont go Hare Krishna Hare Legere about it, its all motivated by profit. I’ve been a T-mobile loyal user far longer than JL has been, I’m sure I’ll be one far longer after he’s done with it too. So what if it’s profit-driven? That doesn’t change the fact that his tactics at T-Mobile have had a resounding effect on the wireless industry as a whole (Now AT&T and Cricket are offering free data roaming and usage in Canada and Mexico in response to T-Mobile, contracts are out, data plans are more competitive). Plus, if consumers and employees are happy with the company, that leads to more business for T-Mobile and harder-working employees at T-Mobile (respectively), which increases profits. I mean, do you want him to be like all the other telecom executives? Assuming JL did work at ATT for decades… Whatever makes you think he actually enjoyed working there? perhaps he stayed so long because he thought he could make a difference from within the company? who knows? maybe its just because he wanted to be in the industry and hey, it’s a job in the industry? I don’t know about you, but I have worked at a few companies in my time, not necessarily because I’m aligned with their direction or beliefs, but more because I had a family to support and working to put food on the table. So there is a whole lot more to the picture than what you see from the street corner, so before you go throwing around accusations, take a look at your self and make sure you can see the whole picture… othewise you just come off as another hater and an A-hole. I’m no T-mobile hater, I’ve been a T-mobile user far longer than JL has been with T-mobile… My point is there is a good chance I will remain a user far long after he isn’t with T-mobile. Let’s see what he preaches then. So what you’re saying is that people aren’t allowed to change their minds. Not trying to change the topic here, but if I am okay with abortion for many years & then decide one day that it is wrong, does that make me a hypocrite? I would surely hope not. Now if I say that it is wrong, but I allow my girlfriend to have one anyway, I can see the hypocrisy in that. The way you’re defining the word is just wrong because it is based on now, not the past. People can & do change & Legere has not shown throughout his campaign to belief anything other than what he preaches. If you disagree, I guess we will just have to agree to disagree then. Principles change as we go through time. Haven’t you once had a principle that you now realize may have been misguided? sure, and if I were to publicly announce my realignment, I would openly admit my misguided past. Has JL ever mentioned he was part of the entrenched industry that he is fighting against now? Now that would be something to tweet about. It’s ludicrous to expect that T-Mobile chief is going to continue rooting for a company he no longer works for. His job is to do the best for who he’s working for now. Hypocrisy has nothing to do with it. It’s called doing your job. IBM and Apple were never competitors since Tim Cook became CEO, they are now partners. I’ve never heard him say anything disparaging about IBM, does he even have a twitter account? Doing your job and hypocrisy are mutually exclusive. There are numerous other executives who’ve had to do the same, they don’t mouth off like JL. When he says ‘them’ referencing ATT he never acknowledges he worked for ‘them’ for decades, and acts like he is offering a fresh perspective and reset for the industry he is so entrenched in. You have to admit he’s portrayed himself as a new outsider looking to make it easy. Why not do that and acknowledge his previous associations? That would harm his street cred as a fighter against the big wigs. JL is here to make money, not reform the industry. There is a good chance he never saw himself running T-Mobile for so long. Being a career executive a certain level of hypocrisy is inherent, that’s what makes them successful. Sad to hear Jim is leaving. Hell of a guy, who I met several times in my years with T-mo. Stuck with the company when he got passed over for CEO when John came in (the right decision, ultimately). Really respect him and wish him well in the future.